When I arrived at my designated makeover studio, I met hairstylist Natasha Leibel and makeup artist Jennifer Fleming, who immediately sat me down and got to work. The makeup station was filled with both tried and true and brand new CoverGirl products. I hadn't yet tried their new range of Trublend products, so I was excited to have a pro test them out on me — and teach me some tricks in the process. The red carpet look I picked was P!nk at the 2013 premiere of Thanks for Sharing, featuring a smoky cat eye and neutral lip. Jennifer started by filling in my brows and highlighting the brow bone and inner corners of my eyes with Bombshell ShineShadow in Ice Queen. 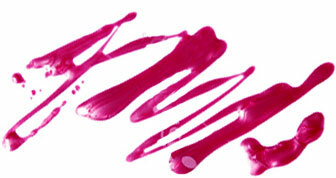 Next, she lined the eye with Flamed Out Shadow Pencil in Silver Flame and gently smudged it out. She then added a wing and dabbed black eyeshadow on top of the Shadow Pencil. “Don't blend too far up,” said Jennifer. “You don't want it to be smoky into the crease.” She finished off the eye look by lining the top and bottom lash line with Liquid Line Blast in Black Fire, and loaded my lashes with the new Bombshell Volume Mascara. For the face, Jennifer used two shades of Trublend Foundation: L2 in the center of the face and L4 on the outside. “It's not for contouring,” she explained. “The colors are not so different. You just want the inside of the face to be bright and lifted.” She also used Trublend FixStick Concealer “where you naturally think to put concealer; around the nose and center of the chin.” Since P!nk's look wasn't very pink — or bronze, for that matter — Jennifer opted for Clean Glow Blush in Peaches. “A peachier tone blush is the perfect marriage,” she said. 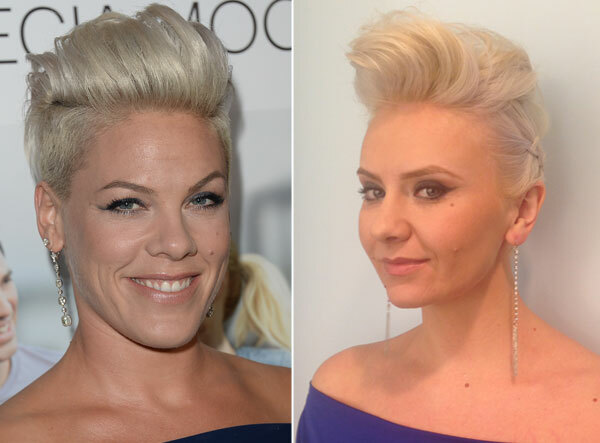 The hair was P!nk's signature pixie cut styled back with extra volume. At first, I was worried about my hair being too long to pull off P!nk's style, but with a few minor tweaks, it came out awesome. Natasha used the new Herbal Essences Naked Shine collection to create this awesome faux pixie that truly captured the singer's style. The whole experience was super fun. It inspired me to take chances with my look and try a whole new style. Thanks, CoverGirl!